In this engrossing journey into the lives of psychopaths and their infamously crafty behaviors, the renowned psychologist Kevin Dutton reveals that there is a scale of "madness" along which we all sit. Incorporating the latest advances in brain scanning and neuroscience, Dutton demonstrates that the brilliant neurosurgeon who lacks empathy has more in common with a Ted Bundy who kills for pleasure than we may wish to admit, and that a mugger in a dimly lit parking lot may well, in fact, have the same nerveless poise as a titan of industry. Dutton argues that there are indeed "functional psychopaths" among us different from their murderous counterparts who use their detached, unflinching, and charismatic personalities to succeed in mainstream society, and that shockingly, in some fields, the more "psychopathic" people are, the more likely they are to succeed. Dutton deconstructs this often misunderstood diagnosis through bold on-the-ground reporting and original scientific research as he mingles with the criminally insane in a high-security ward, shares a drink with one of the world's most successful con artists, and undergoes transcranial magnetic stimulation to discover firsthand exactly how it feels to see through the eyes of a psychopath. As Dutton develops his theory that we all possess psychopathic tendencies, he puts forward the argument that society as a whole is more psychopathic than ever: after all, psychopaths tend to be fearless, confident, charming, ruthless, and focused qualities that are tailor-made for success in the twenty-first century. 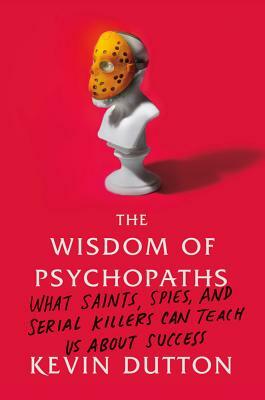 Provocative at every turn, "The Wisdom of Psychopaths "is a riveting adventure that reveals that it's our much-maligned dark side that often conceals the trump cards of success. Dr. Kevin Dutton is a research psychologist at the Calleva Research Centre for Evolution and Human Science, Magdalen College, University of Oxford. He is a fellow of the Royal Society of Medicine and the Society for the Scientific Study of Psychopathy. Dutton is the author of "Split-Second Persuasion." His writing and research have been featured in "Scientific American Mind," "New Scientist," "The Guardian," "Psychology Today," and "USA Today." He lives in Oxford, England.